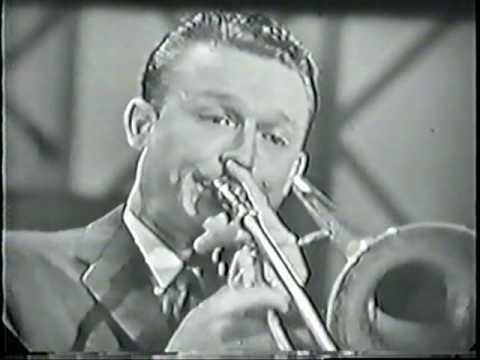 Jimmy Henderson was a trombonist on the Lawrence Welk Show from 1957 to 1960. Henderson, a native of Wichita Falls, Tx, won several competitions in his early teenage years. After studying at the Cincinnati Conservatory of Music, he went on to tour with Jimmy and Tommy Dorsey prior to the Welk Show in 1957. After leaving the show in 1960, he played in his own orchestra, the Jimmy Henderson Orchestra. In 1975, Jimmy Henderson was hired by Glenn Miller Productions, Inc. as the new director of the Glenn Miller Orchestra, opening at the Riverboat in New York City. Under his stewardship, the orchestra achieved new heights in musical performance and received great national and international acclaim, including an appearance at President Ronald Reagan’s first inaugural ball in January 1981. Jimmy retired from the Glenn Miller Orchestra on May 31, 1981. He passed away in New York City in June 1998.